The new team aims to shift taboos around breastfeeding, increase instances of breastfeeding nationwide and advocate for families as health care regulations evolve. Aeroflow Breastpumps at the LEAF festival in Asheville, NC. Aeroflow Healthcare today announced that the company has formed a breastfeeding advocacy department to promote access to breastfeeding support, supplies and services for families nationwide. With the introduction of this team, the company expands its advocacy efforts for healthy families, aiming to increase breastfeeding rates on both a local and national scale. Aeroflow’s announcement arrives on the heels of National Breastfeeding Awareness Month (August), as the company continues to expand its advocacy efforts to increase breastfeeding and pumping among new and working moms — not just at home, but at work and in public, as well. Meghan Bausone is the Breastfeeding Advocacy Strategist at Aeroflow Healthcare. She is responsible for the development of initiatives to improve breastfeeding rates through education and advocacy efforts. She has a background in women’s health including midwifery, working as a doula and providing direct-care support for teen mothers. Danny Polich is the Director of Government Affairs at Aeroflow Healthcare. He works with Senators and House Representatives to protect existing breastfeeding laws and advocate for better policies in the future. Danny strives to make sure mothers are represented on the Hill and has been able to keep breastfeeding policies ‘off the table’ in recent rounds of health care negotiations. The Aeroflow Breastpumps advocacy team has been diligently working to build connections and further awareness of the benefits of breastfeeding. Recently, Aeroflow was recognized by the North Carolina Breastfeeding Coalition as a Breastfeeding Friendly workplace and business. The award recognizes companies that respect and welcome breastfeeding mothers by providing a specified lactation space for employees and community members. Additionally, Aeroflow was recognized as a workplace that makes it a priority to support breastfeeding employees by offering a specified room for breastfeeding and pumping. Aeroflow was one of 5 Asheville businesses to make the list. The advocacy team attended several August events, including a local festival during World Breastfeeding Week and a conference focusing on policy and practice change. The team attended LEAF (Lake Eden Arts Festival) in Asheville, NC during World Breastfeeding Week (August 1-7) to promote breastfeeding resources in Western North Carolina. During the festival, guests were able to learn more about how they can locally encourage breastfeeding and support mothers in the community. 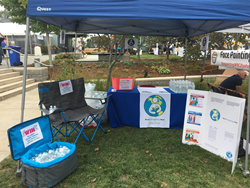 The team created a breastfeeding friendly area and attracted the crowd by giving away water and advocacy stickers to festival goers. Additionally, they organized a raffle giveaway of a folding cooler and camping chair to attendees who were willing to write a sentence about why breastfeeding was important to them. On August 4th, the advocacy team attended the Seventh National Breastfeeding Coalitions Conference which featured sessions on implementing change and strengthening the capacity of breastfeeding coalitions to increase instances of breastfeeding in the United States. Aeroflow Breastpumps, a subsidiary of Aeroflow Healthcare, is a Durable Medical Equipment provider specializing in helping pregnant and nursing women qualify for their breast pump through their insurance and the Affordable Care Act. To learn more about Aeroflow Healthcare’s advocacy efforts and the development of the Breastfeeding Advocacy team, visit aeroflowbreastpumps.com. If you are a Lactation Consultant interested in partnering with Aeroflow, contact Danny Polich.